A deadly hostage-taking at a Catholic church in Normandy, in which a priest was killed and another person seriously wounded, was a terror attack committed in the name of ISIS, French President Francois Hollande has said. Speaking to journalists in the northern French town of Saint-Etienne-du-Rouvray, where two men took five people hostage during morning Mass Tuesday, Hollande said the attack was a "cowardly assassination" carried out by "by two terrorists in the name of Daesh" -- another name for ISIS. In the latest Islamist atrocity to roil France, an 84-year-old Catholic priest, the Rev. Jacques Hamel, was killed when two men stormed the church in the northern region of Normandy, Dominique Lebrun, the Archbishop of Rouen, said in a statement posted on the diocese website. Police and firemen arrive at the scene of the attack. 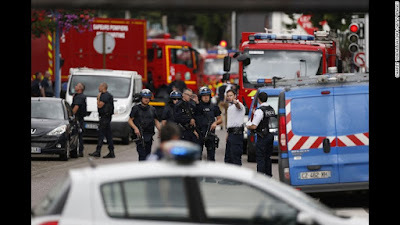 Besides the slain priest, two nuns and two churchgoers had been taken hostage, CNN French affiliate BFMTV reported. One of the hostages was seriously wounded, and is "between life and death," French Interior Ministry spokesman Pierre-Henry Brandet told reporters. The situation ended when the two attackers were shot dead by police, he said. "The two killers came out and they were neutralized," he said. The priest's killing comes on the back of a string of violent attacks across Europe in recent days, some claimed by the Sunni terror group ISIS, most notably an attack in the French city of Nice less than two weeks ago that left 84 dead. France has been under a state of emergency since the Paris terror attacks in November last year. Speaking to reporters, Hollande said: "Daesh has declared war on us. We have to win that war." But urged the public to remain unified in the face of the threat. "All people feel affected so we must have cohesion ... no one can divide us," he said. "Terrorists will not give up on anything until we stop them." The Paris anti-terror prosecutor has taken over the investigation into the attack, France's Interior Ministry said in a statement. The Vatican has condemned the attack, calling it "terrible news" on the back of a string of recent violent attacks in Europe. It said the Pope had been informed of the attack and shared the pain and horror in response to the "absurd violence." The statement said the violence was particularly horrific as it had taken place in a church, "a sacred place where the love of God is announced." Lebrun said in a statement that the "Catholic church cannot take up any other weapons but prayer and brotherhood among men." He called on the faithful "to lower their arms before violence and to become an apostle of a civilization of love." Other religious leaders were quick to condemn the violence, with the Archbishop of Canterbury, Justin Welby, tweeting: "Evil attacks the weakest, denies truth (and) love, is defeated through Jesus Christ. Pray for France, for victims, for their communities."